Wall Township, NJ — ‘Observing Earth: Beyond Hurricane Sandy’ is an Earth Month event to update the public on Earth’s changing climate, with a focus on risks and solutions. The event will be held Saturday, April 12, 2014, from 2:00-4:00 pm at the InfoAge Science History Museum in Wall Township, NJ. Last year’s ‘Earth Day Gathering’ event was attended by more than 80 people. This year’s lineup will include Dr. Alan Robock, Professor II in the Department of Environmental Sciences at Rutgers University and the lead author of IPCC; Joseph Robertson, Strategic Coordinator for Citizens Climate Lobby and author of the book Building a Green Economy; and Brian Reynolds (host and moderator), who is a 350.org member and certified Climate Reality Project presenter. 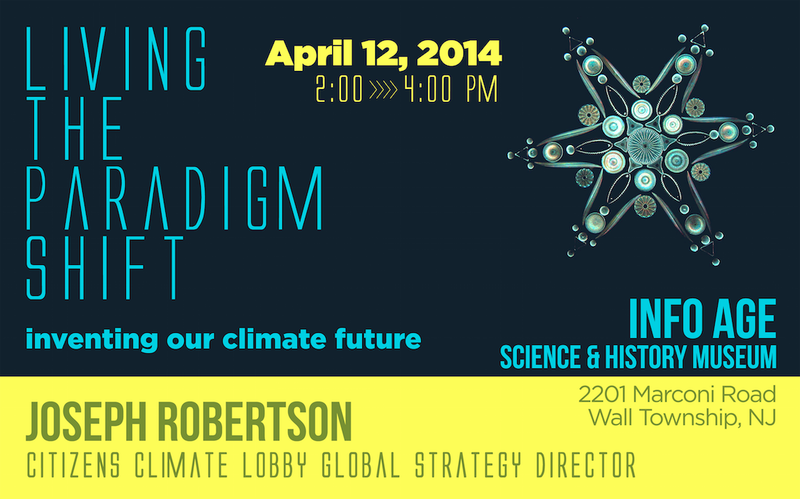 The event will discuss several topics related to climate change, with some new perspectives. Dr. Robock will discuss the parallel dangers of nuclear conflict and climate change in a talk titled “Climatic Consequences of Nuclear Conflict: Nuclear Winter Still a Threat”. The title ‘Observing Earth’ makes reference to the extraordinary history of scientific achievement at the InfoAge site. In 1960, Camp Evans was ground station for TIROS-I, the world’s first successful Earth-observing weather satellite, allowing for the first time a live feed of images of the Earth from space. That breakthrough in science, engineering and global information gathering, was a major success for NASA only two years after the agency formed, so successful that it expanded to create the vital Earth-observing work of the National Oceanic and Atmospheric Administration (NOAA). Today, the Camp Evans National Historic Landmark exists as part of a science history museum called InfoAge. Fred Carl, InfoAge Director, admits most people are not aware of the historical impact the site had on modern society. “Advanced warning of an approaching hurricane gives time for people to flee to safety. Millions of lives have been spared thanks to the technology that was developed here” says Carl. 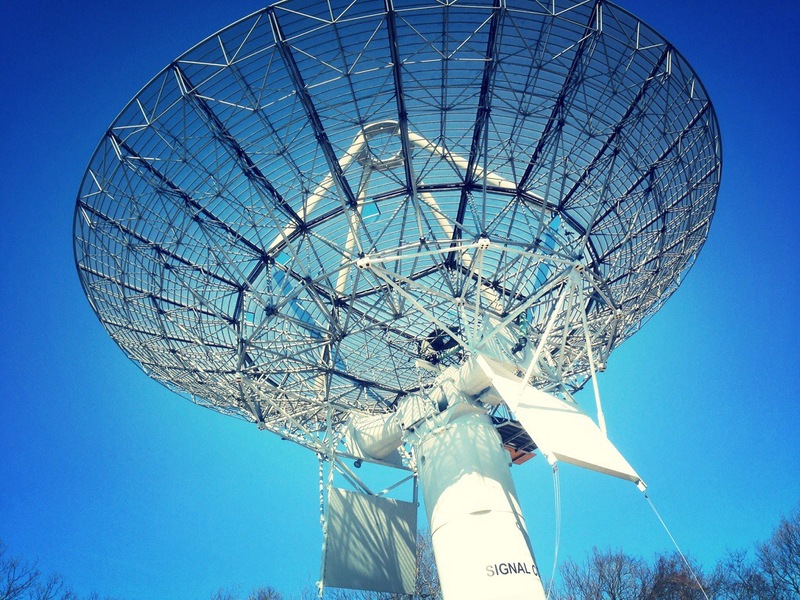 The historic TIROS radio dish and a 1940s Dymaxion Deployment Unit designed by green architecture pioneer Buckminster Fuller will be open from 1:00-5:00 pm on Saturday. Efforts are currently underway to restore the historic artifacts and optional guided tours will be offered at the conclusion of the program at 4:00 pm. Local New Jersey chapters of 350.org, Citizens Climate Lobby, the Sierra Club and Monmouth Transitions are co-sponsoring the event. There is a suggested donation of $5 per person. All proceeds go to supporting the museum. Schweickart said he felt he had been put in that situation to be “the sensing element” for the entire human species, to understand a fundamental reality about the structure of the universe in an entirely new way. Earth-observing satellites carry on that work, matter-of-factly feeding us information with which to better understand our world, and our situation in it. NOAA was created in 1970 by Pres. Nixon, “… for better protection of life and property from natural hazards … for a better understanding of the total environment … [and] for exploration and development leading to the intelligent use of our marine resources.” The technology that allowed for TIROS-I in 1960 also allowed for the WWI-era National Advisory Committee on Aeronautics (NACA) to become, in 1958, the global leader in space exploration we know as NASA, which only 11 years after it was formed successfully landed American astronauts on the Moon and returned them safely to Earth. A nuclear war between any two nuclear nations, with each country using 50 Hiroshima-sized atom bombs as airbursts on urban areas, would inject smoke from the resulting fires into the stratosphere. Climate model simulations find that the smoke would absorb sunlight, making it dark, cold, and dry at Earth’s surface and produce global-scale ozone depletion, with enhanced ultraviolet (UV) radiation. The climate change would be unprecedented in recorded human history, and crop models show that it would reduce agricultural production, with decreases of 10-40% in yield of winter wheat, rice, soybeans, and maize averaged over a decade. The impact of the nuclear war simulated here, using much less than 1% of the global nuclear arsenal, could sentence a billion people now living marginal existences to starvation. The greatest nuclear threat still comes from the United States and Russia. Even the reduced arsenals that will remain in 2017 after the New START treaty, about 4000 between the U.S. and Russia, threaten the world with nuclear winter. The world as we know it could end any day as a result of an accidental nuclear war between the United States and Russia. With temperatures plunging below freezing, crops would die and massive starvation could kill most of humanity. The continued environmental and resulting humanitarian impact of the use of even a small number of nuclear weapons must be considered in nuclear policy deliberations.